An Factory Sealed is marble or stone pieces in a polymer resin binder. Unfortunately, there are too many factories that choose a sealer for the wrong reason (price), apply it incorrectly (thinly), or for marketing reasons (try to make it worth more money). What looked wonderful when first installed can be a problem after some time passes. The grout still needs to be sealed. If a color was applied to the tile before sealing, or in the sealer, it is a more complex repair problem if the sealer peels. The factory sealer can be protected from traffic wear - see below. A Mexican tile with a sealer already applied. Actually, there are no advantages. The grout still must be sealed and that is more tedious than sealing the entire floor (tile and grout) at one time. 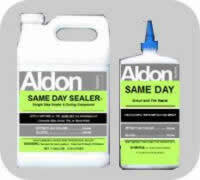 Consider using Aldon "Grout Easy" to protect the factory sealer from scratching during grout installation. How good is this factory applied seal job? Unfortunately, too many factories select a sealer for its price and not for its long term benefits. If it is not a good quality sealer and not applied properly for its type, it could start to peel or flake. Then, you will have to strip and re-seal properly. With Mexican tile and other soft body materials, a "paint on coating" application does not strengthen the soft body and the surface can deteriorate from foot traffic. Here is a tip to help evaluate the material and sealer. Break off a small section of tile corner so you can see if the sealer has penetrated or is just a coating. Lightly scratch the sealer with a coin to see how easily it peels off. A strong, penetrated sealer will not scratch off easily or at all. #2. If the Factory Sealed tile is grouted, but grout is not sealed. #3. If the Factory Sealed tile has a failing sealer. "Same Day Sealer" on Factory Sealed. This sealer is Water Base | Penetrating Type. Provides: No color enhancement or gloss. Coverage guidelines (depending on absorption) 250 to 600 sq.ft./gal. "Same Day Sealer" is recommended when sealing only the grout. It wipes easily from the tile face to make the process easier. Do not use a petroleum solvent based sealer for the grout as it will melt the factory sealer on the tile face. If the factory sealer needs to be removed, see surface preparation above. Easy Care Products: for an Factory Sealed floor. "Maintain" - for no streak wet mopping of Factory Sealed and all other types of flooring. You may have heard of concerns about Factory Sealers. All of them would be prevented with the information we provide here. Therefore, you can have the floor you want!